New to EWG’s Skin Deep? Welcome! This site is packed with important health information about the cosmetics you – and your family – use every day. You’ll find product and ingredient safety ratings, health information about cosmetics ingredients and smart shopping tips you can trust. Want to find out if your products are safe? Look up a product. Enter its name in the white search window. Look up an ingredient. If you want to know if a particular ingredient is safe or if you’re allergic or want to avoid it for other reasons, the database contains information about possible health concerns, which products contain it, other names — and a whole lot more. Search by company. Want to know how a certain company stacks up? Search its name to see how its products rate. Find safer alternatives. Pick a category (toothpaste? shampoo? mascara?) and peruse product ratings. Warning: goods in some categories, like hair relaxers, have uniformly high hazard scores. For every product and ingredient in Skin Deep, there’s a two-part score – a hazard score and a data availability score. The ingredient hazard score, from 1-10 reflects known and suspected hazards of ingredients. The data availability rating reflects the number of scientific studies in the published scientific literature and the number included in the Skin Deep database. To calculate a product score, we tally the hazards of individual ingredients and evaluate each product in relation to the rest of the products in the Skin Deep database. The safest products score well by both measures: a low hazard rating AND fair or better data availability. What do you mean by “data availability”? The “data availability” rating measures how much is known about an ingredient. Not all ingredients are equal when it comes to safety data. Some have been studied extensively. For others, there is only a modest volume of research. Some have not been tested at all. A product’s low score on the hazard scale doesn’t mean much if scientists know very little about the chemicals in it. Your best bet? A doubly good score: low hazard rating + high data availability. When you search in the Skin Deep® cosmetics database, you may come across a number of unscored products at the top of your search results. These products have gone through EWG’s verification process, and have earned an EWG VERIFIED™ mark. 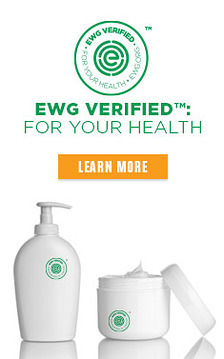 EWG VERIFIED™ recognizes products that meet EWG’s strictest standards for human health. These are products provide full transparency for all ingredients, use good manufacturing practices and avoid EWG’s chemicals of concern. All EWG VERIFIED™ products go through a rigorous screening process before they’re approved for the mark, and they must score within the green, or low hazard, range in Skin Deep. Want some simple tips to shop smart? Click here to donate and get your free wallet guide. Finding the safest products in stores near you isn’t always easy. We recommend that you hit the store with a list of options. Or, save a trip and find your product on Amazon or other online retailer. Use your buying power to change the market – and help make personal care products safer for us all. Stay informed by signing up to receive email tips, action alerts, promotions to support our work and more from EWG. You can opt-out at any time.